Acts of Terrorism have existed for centuries but since the late 1960s they have become more numerous and wide-ranging, giving terrorism fresh importance in the domestic affairs of countries afflicted and to the international community. Terrorism, or international terrorism, is not a constant but rather an evolving construct, manifesting itself in differing ways over time and in specific geographical contexts. Following the Cold War, terrorism has reared its head in places and in ways that were less common earlier. Presidents Reagon and Clinton in the 1980s and 90s stressed the importance of combating terrorism; President George W. Bush, too, recognised the threat. However, the attacks on the World Trade Center and the Pentagon on 11 September 2001, followed by incidents elsewhere, notably in Madrid on 11 March 2004, have given impetus to the study of terrorism in academic circles, among journalists and a heightened awareness by the general public. A major problem for rigorous analysis of terrorism has been an absence of readily available, widely disseminated research and serious academic discussion; many valuable articles have appeared in a range of academic and professional periodicals. Often these journals have limited circulations and even the great academic libraries of the western world, do not posses a full complement of articles. Thus the study of terrorism and the ability to offer university options in the field are frequently hampered by the absence of literature. This problem is vastly greater in the many small educational institutions. Even in libraries that do have a large number of the periodicals, the problem of searching out germane articles is demanding and time-consuming. The present series is directed towards providing a partial remedy to this problem. 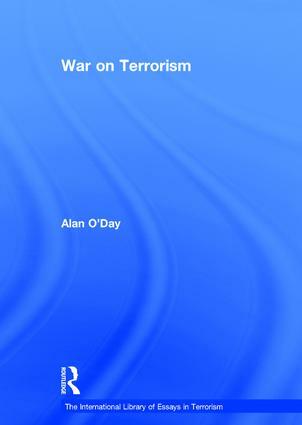 It seeks to provide in a number of volumes, pertinent material for the study and understanding of terrorism, making these available to a wider audience. An important feature of the volumes is that the articles selected are intended to reflect various opinions and to afford a glimpse into the controversies about such matters as the very definition of terrorism, its various dimensions and future prospects.